We are the only tiling company in the UK to offer this membership. Total personal back up support after you have left the course. 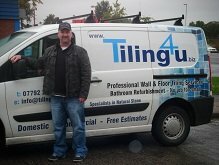 Get the answers to any tiling problems you are having or business related questions answered 7 days a week, 365 days per year with priority reply’s. Learn how to prep walls for tiling with plasterboards, learn how to skim ceilings and walls, repairs , fit coving and deal with plastering associated problems. We are always getting asked for tilers from house builders and other tilers in your area, with this listing we can put you in contact with any work in your area. Impress your customers. 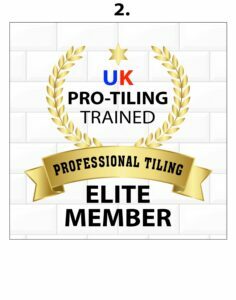 You will receive 4 quality laminated upgraded certificates certifying your Elite Membership status with UK Pro Tiling and all the tiling units you have passed throughout the course. Get an understanding of how to complete trade account forms from CTD, Topps Tiles, Tile Giant etc and what proof they need to open your account. Show all your customers that you have UK Pro Tiling Certified professional Installer and Elite member status on your vehicles and websites.